Other historical temples which have the stories retold for hundreds years. 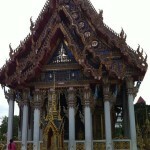 This temple was previously called “Wat Sak” because its area had a lot of teak and rubber wood in past. 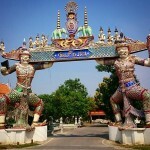 According to the history, King Taksin set up the army and the troops were prepared in Wat Sak in order to regain independence of Ayutthaya because the temple is located in an appropriate location. He placed the army flag here and then used overlap rocks to prevent the flag from falling. He also ordered to build “Shin Ngern” texture principle Buddha image and disciple Buddha image. 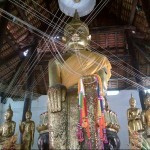 After he successfully regained independence, he came back with the survived soldier to renovate the temple and then changed the name of temple to “Wat Sao Thong Hin”. Inside the temple, there is Luang Phor Toh Temple hall stands in the middle of a pond, enshrined Luang Phor Toh Buddha image, red sandstone Buddha image and metal Buddha image which dressed in late Ayutthata period style. 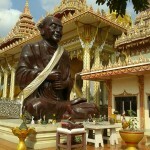 The metal Buddha image has been lost, only Luang Phor Toh Buddha image, red sandstone Buddha image left. At present, both Buddha image enshrined in the new church. There is a story being retold that once water was flowing from the Chao Phraya River entrance to Nonthaburi province. But in front of Wat Sao Thong Hin still has fresh water without saline mixed. 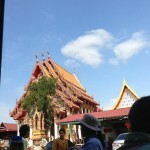 Villagers were greatly amazed because saline was appear everywhere, except area in front of Wat Sao Thong Hin. So villagers brought the fresh water for consumption because they belief the fresh water was occurred by Luang Phor Toh’s marvelous.